Home » Chinese Horoscopes 2020 » Horse Horoscope 2020 – Free Astrology Predictions! Horse Horoscope 2020 – Free Astrology Predictions! 2020 is a great year to begin to focus on the future. While the present is a great time, the future will be even better. Horse horoscope 2020 predicts that you are likely to begin many large projects that will carry on into future years in 2020. There will be some difficulties in your way, but also many great opportunities as well. Let your instinct be your guide; don’t be afraid to be spontaneous. Your optimism and wit will be your strongest allies this Chinese year of the white metal rat. So, make sure to use them well. The wild horse is what you should think of when you think of the Chinese zodiac sign horse, not the domesticated horse. Like wild horses, people born in the year of the horse are energetic people who love to be active, travel and try new things. They also love the idea of love, compassion, and closeness. These people are wise and fun-loving, but they can also be impatient and ever-changing as well. All of these traits are sure to affect the horse person’s Chinese horoscope for 2020. Is 2020 lucky for the horse? Your love life is sure to be passionate and exciting this year. You are the one that will need to make the exciting changes in your relationship this year. If you want something from your partner, then you need to let them know directly. Dropping hints might not cut it. If you are currently single, then this is a good year to try to date someone, unlike anyone that you have dated before. If you are single, then obviously the people that you have dated before are not right for you. Finding different kinds of people to date can let you know what you like in a relationship. Or you may get lucky and find the right kind of person. Will the horse get married in 2020? Or will the year of the horse have a baby in 2020? Going on trips with your friends and family can also be a source of joy for you in 2020. There are likely to be changes that are out of your control within your social circle as well his year. Be patient with these changes and things will work out at the end of this Chinese New year 2020. Horse 2020 prediction shows that this year you are sure to advance in your career one way or another. First, you will need to do something to deserve this upgrade. Work your hardest. Suggest new projects to your superiors that will help you to show off some of your natural talents. You will still have some problems advancing at work if you do not learn how to work with your coworkers better. While this can also help them, this skill can also make you shine at the workplace in the 2020 year of the rat. Once the middle of the year hits, you should have made enough progress to take it easy for a while. If you have any financial problems, then you should try to solve them before you make any more large purchases. Horse 2020 Chinese horoscope suggests you need to learn how to budget better this year and it is sure to help you in the future. Horse, you will need to use up a lot of your energy if you want to get things done this year. This means that you need to take care of your body if you want energy to get things done in the first place. Try to exercise a few times a week, eat well, and make sure to get enough sleep. Don’t let your body or mind slow down in 2020. January 2020 might be a good month if you are careful with finances and stop lending money to people. February 2020 is when others will need your help. Also, be sure to maintain a healthy exercise regime and proper diet. March 2020 will be a favorable month when it comes to love and romance. There will be progress on the business and career front too. April 2020 is when your patience will be tested to its limit. Your success depends on how well you can bear the lows. May 2020 is another month filled with challenges. But obstacles are something that you strive to jump over. 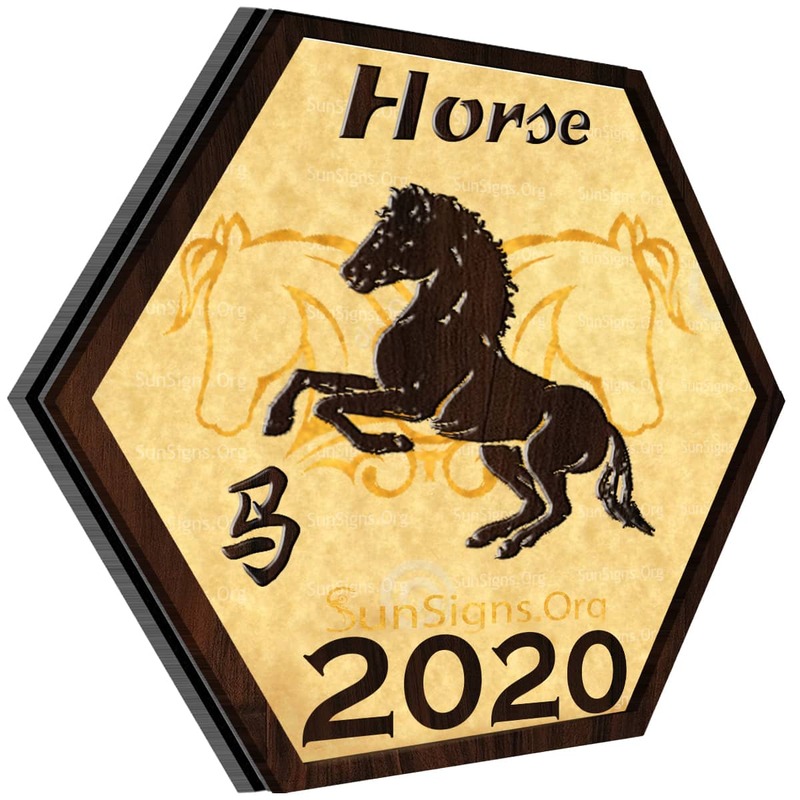 June 2020 for the Chinese horse sign will be unique and exciting as many new opportunities will come knocking on their door. July 2020 will come with its share of favorable and adverse events. Your success depends on how you deal with the situation on hand. August 2020 is a good time to go on a vacation with your loved ones. Be careful when dealing with colleagues and partners as they might have a hidden agenda. September 2020 is a period when your progress goals should matter and not your outcome goals. October 2020 is when you must move ahead with care in your personal and professional relationships. November 2020 might be a month when you must take extra precaution when it comes to minor illnesses. December 2020 is when you will be tired after the whole year has gone by. Now is the time to relax and enjoy the holidays with your family and friends. 2020 Feng Shui yearly prediction for the horse indicates a period when your health might need some extra care. Horse horoscope 2020 predicts this year is all about changing yourself so that you can become better in one way or another. This doesn’t mean that you need to make any drastic changes in your life. Try something new as often as you can; you may find something new that you love! Make sure that you spend some time with the people you love in 2020. If you do all of these things, then you are sure to have a great year! Previous Dragon Horoscope 2020 – Free Astrology Predictions! Next Sheep Horoscope 2020 – Free Astrology Predictions!